PCMS Design has recently been awarded the status of ‘Accredited Planning Agent’ by Central Bedfordshire Council. This scheme has been created by the Council to recognise continued regular compliance with Planning Regulations, and also adherence to the standards for using CBC’s Development Management Services. The Accredited Agent scheme recognises that planning applications are submitted to the Council in an accurate and timely manner, with the relevant amount of detail and with the correct accompanying information. 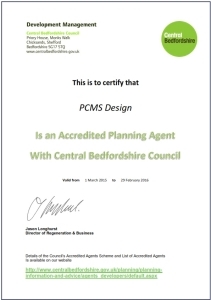 Staff from PCMS Design regularly attend planning seminars and consultation sessions at Central Bedfordshire Council, in particular Planning Agents training seminars, and also sit on the Planning Services Client Side Panel. We are very pleased to have received recognition from the Council by becoming an Accredited Planning Agent.